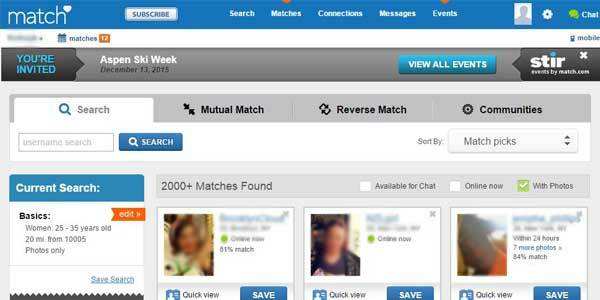 Since its creation in 1995, match.com has grown into one of the biggest and best online platforms for singles. With an estimated 30 million members across 24 countries, you can be sure that your dream date is only a few clicks away. Among the range of excellent features, the “Profile Pro" service sharpens your profile to give you the very best chance of finding a perfect match. Meanwhile, the functionality at match is top class, with small details such as the ability to “like" and comment on photos really adding to the user experience. Throw in some excellent offline events in major cities and as any Match.com dating site review will tell you, this is a whole lot more than just a dating site. Quite frankly, you will be spoilt for choice for features. You will find a quality online magazine, which includes dating advice from the one and only Dr. Phil! And there is a whole range of tools which simplifies the entire search process. For example, you can specify “deal breakers" when setting search parameters. Once you have honed in on your ideal user, there are numerous options for getting in touch. Beyond the standard private message, instant chat and suggestive wink, a great way to test the water is to comment on photos. And once you have made contact, a tab on the side of each photo indicates whose turn it is to make the next move. Match.com has you covered with quality enhancements every step of the way. Meanwhile, offline events include not only standard bar and restaurant meet-ups but also creative detective evenings and more. 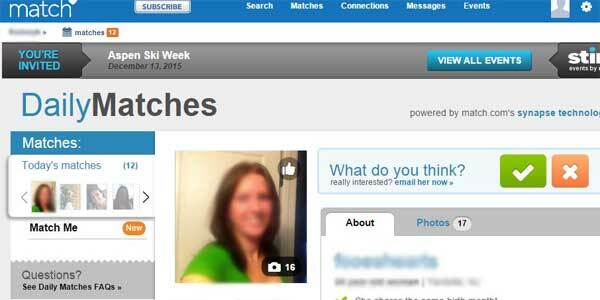 Despite the huge number of users, match.com creates the feeling of community. Quick and simple, the match.com sign up will have you browsing within minutes. You will be asked a range of standard questions including gender preference, ethnicity, physical features such as height and you will be required to submit an e-mail address and password. You will be asked to verify your account via the e-mail address you provide. Because match.com uses the information you submit to make automatic matches, you would also be well advised to take some time and fill in the “About You" and “About Your Date" sections as accurately as possible. Of course, you can upload multiple photos and you can edit and alter your profile as much as you like. As you would expect from a top quality platform with millions of users, security is paramount at Match. For a start, there is a commitment that your information will not be shared with third parties. You will also find some useful safety tips for both online and offline dating. Meanwhile, the fact that users must verify their account via e-mail means that many scammers are filtered out straight away. Free members at match.com can create a profile and browse, but are limited to communicating exclusively via winks. So, if you really want to find someone special, you will need to sign up. A 3-month deal will set you back $29.99 monthly, a 6-month package costs $25.99 per month and just $22.99 for 12 months. If you are unsatisfied with the service after 6 months, you will receive an extra 6 months membership for free! There are also some attractive add-ons on offer. For example, you can purchase a service which notifies you each time an e-mail you sent is read and an extra $3 will see your profile display at the top of relevant searches for 30 minutes. Although there is plenty on the site, Match.com is entirely uncomplicated. You will find everything you need within touching distance in the tabs at the top of the page. You are just a click away from conducting a search, viewing matches, checking your messages and glancing at the useful “Connections" tab which lists favorite profiles and other handy information. There are also some helpful touches to simplify the process. For example, the “Love At First Sight" quiz helps you pinpoint what you’re looking for and the “Deal Breakers" feature helps eliminate unsuitable matches. Meanwhile, the mobile platform keeps you up to date, even sending e-mail and text reminders. As any match.com review will tell you, the search options are outstanding. You will automatically be presented with suggested matches, but if you choose to conduct a manual search, the options are exhaustive. The advanced match.com search is incredibly detailed, including a depth of search criteria hard to find elsewhere, such as exercise frequency. You can of course save the searches you like. There are also a number of useful and innovative searches you can conduct too. “Match Words" acts as a keyword or tag search, while “Reverse Match" allows you to see what kind of people are looking for someone like you. Match claims to have arranged more dates, relationships and marriages than any other dating site. And it would be hard for any match.com review to argue with that. This is an excellent dating platform, which combines innovative features such as “Reverse Match" with a simplicity which makes it a pleasure to use. Meanwhile, you will struggle to find a 6-month money back offer anywhere else. It is easy to see why match.com is available in 15 languages, popular the world over.